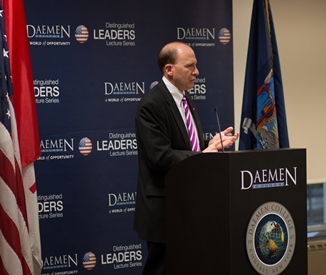 AMHERST, N.Y. – The U.S.-Iran nuclear deal aimed at limiting Iran’s nuclear production capability in exchange for the lifting of economic sanctions was assessed by David S. Jonas, an international expert on nuclear nonproliferation, as featured speaker in the Daemen College Distinguished Leaders Lecture Series. Jonas noted the deal is an important step toward preventing Iran from obtaining nuclear weapons but there remain significant challenges to ensuring Iran adheres to the agreement. According to Jonas, the deal places restrictions on Iran’s uranium enrichment, reduces the number of centrifuges and cuts its stockpile of low enriched uranium while still allowing the country to pursue a nuclear energy program for power and medical purposes. In return, economic sanctions will be lifted, giving Iran billions of dollars in assets that had been frozen. “Essentially, the intent is to curb Iran’s nuclear program but the agreement does not address current Iranian nuclear capabilities and its infrastructure to continue to develop its program,” said Jonas.